Don't forget to enter my giveaway for At Home With Handmade Books! 6 chances to win! Entries will be closed on September 22, 2011. Good luck! This crochet cuff works up very quickly and uses single crochets, chains and double crochets. 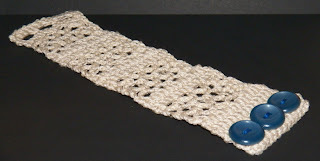 The same stitch can be used for a scarf. The base is a multiple of 6+1, although it can be modified for a multiple of 3+1 by changing the end of the rows. Size 3 Cotton thread or equivalent- for my friends not in the US, size 3 cotton is pretty close in thickness to a light DK or Aus 5 ply. Wool will be stretchier, but it should work. The buttons used in my example are vintage buttons from my button box. Otherwise, I think Dritz size 30 fabric covered button kits would have been very cute! These have quite a bit of stretch, but I made mine a bit loose so it wouldn't distort. Your mileage may vary, so check it as you make it. Row 2: ch 1 (does not count as first stitch) sc in each sc. Row 11: ch 1 (does not count as first stitch) sc in each sc. Row 12: ch 1 (does not count as first stitch) sc in each sc. Repeat Rows 5-12 3 more times for a total of 4 mesh areas. Check cuff on wrist. If you need to add a couple more rows of single crochet, do that. Break off thread and weave in ends then stitch the 3 buttons into place on that side. 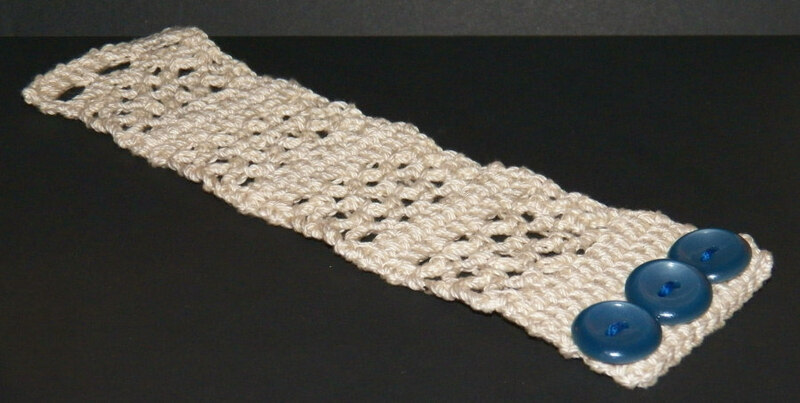 I do my knots between the button and the crochet so I don't have ends showing on the back of the bracelet. If you have very small wrists, or prefer the bracelet stretched, you can either switch to a smaller hook size or remove one row of sc from the sc sections so it's only 2 rows instead of 3. Click on the chart for a larger version if you prefer charted patterns. If you don't know how to read international crochet notation, but would like to try it and feel confident with the written pattern, in international crochet, a 0 is a chain, X is a single crochet, and the crossed T is a double crochet. With other patterns, the T will have the number of crosses that you work off the stitch, so a T with no cross is what Americans call a "half double crochet". One with 2 crosses would be what we call a treble or triple and so forth. I came across your brcelet on the internet. 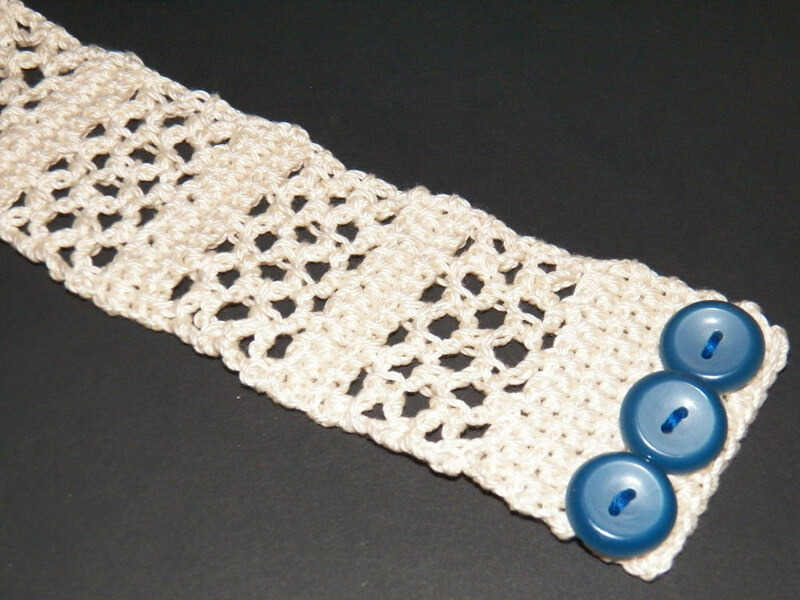 Im looking for a program (free or inexpensive) that I can make a pattern from the international crochet notations like that of your bracelet. How did you make your pattern?